Don’t you love to get your money’s worth? 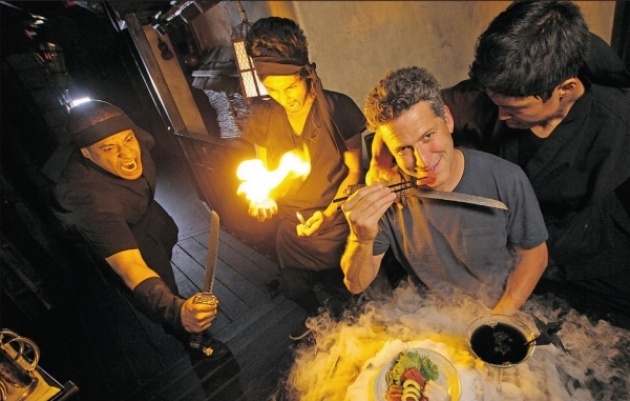 Going to a themed restaurant is a great way to not only satisfy your hunger, but also cure your boredom. Here are a few weird joints from around the world where your dinner is guaranteed to come with a show. This subterranean labyrinth-like Japanese restaurant is the only place in the world where you’ll be served by a ninja. In this unique interactive eating experience, guests are treated to fine Japanese cuisine, all suddenly being whisked away to the world of 15th century Japan—complete with sword fights and martial arts. Did you ever want to experience what it’s like to be an undercover spy? 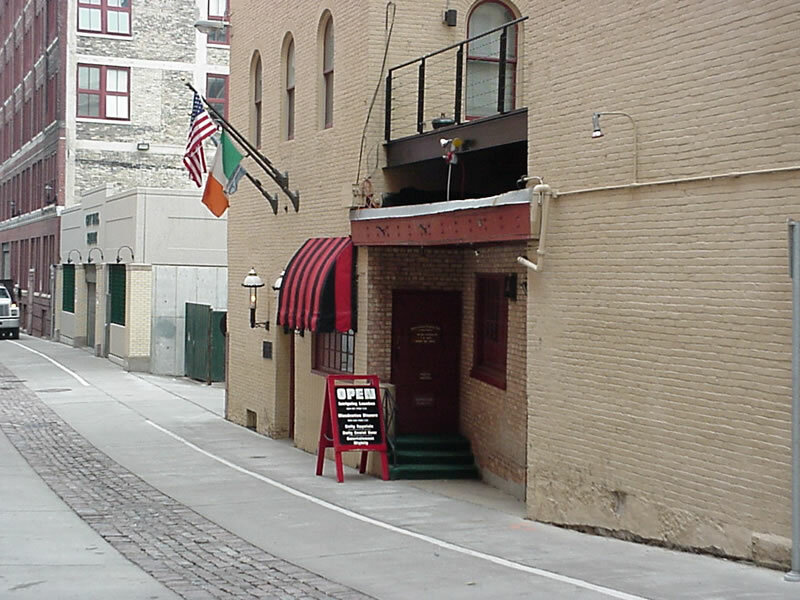 This nondescript-looking restaurant in Milwaukee may not look like much, but in fact, it’s an one-of-a-kind spy- themed restaurant. This top-secret dining destination is designed to give the average person a chance to see what it would be like to live as a counterintelligence agent. It’s so secret that there’s no sign in front of the building and you need a password to enter. 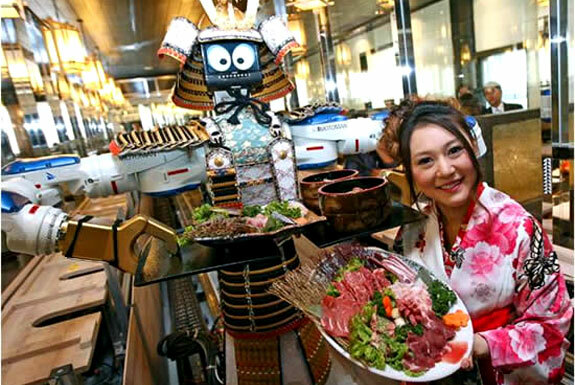 This Japanese restaurant in the heart of Bangkok targets high-tech and Sci-Fi enthusiasts by having its guests greeted and served by robots. This restraint of the future is so far the only one of its kind in the world. The automated staff, dressed up as samurai warriors, also cooks all the meals (with a little human help). After serving the meals, the robots transform into dancing machines and put on a show for customers. 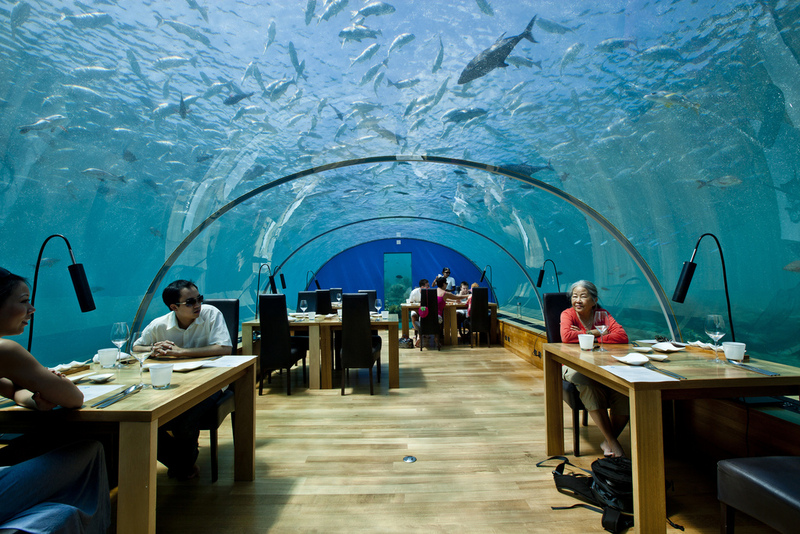 Built 16 feet underwater in the heart of the Indian Ocean, this aquarium-style underwater restaurant is truly the height of luxury and elegance. This acrylic capsule with transparent walls offers 180-degree panoramic views of the ocean life surrounding it while providing diners contemporary European cuisine over a six-course dinner menu. If you ever wondered what it’s like to eat from a toilet, this is your chance! At the Modern Toilet Restaurant, all meals come served inside a bowl the shape of a commode. Believe it or not, this concept has been so successful that other toilet-themed diners have popped up across Asia. 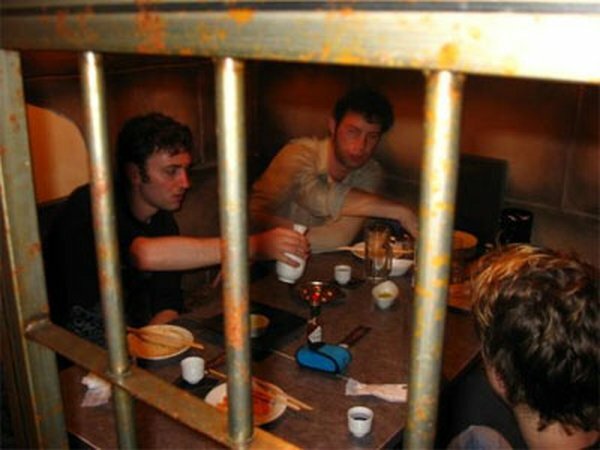 Ever wanted to know what it’s like to eat behind bars? At Fortezza Medicea Restaurant, you’ll be eating inside a working prison, where the wait staff consists of actual inmates. Not convinced? The food has received rave reviews and there is a months-long waiting list for reservations. As an added precaution, guests are served their food on plastic plates with plastic cutlery. Just in case. Can you think of anything better than enjoying a delicious meal while experiencing a simulated earthquake measuring 7.8 on the Richter Scale? Okay, so probably a lot of things come to mind. Still, you can’t say it wouldn’t make for a thrilling night out! No, you’re not seeing double. 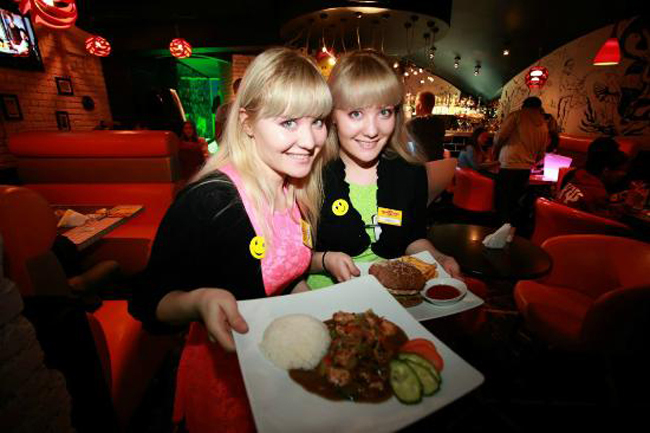 Twin stars is likely the only restaurant in the world to only hire identical twins as servers—all identically dressed. That’s right, if you don’t have a biological doppelganger, you won’t be able to land a gig at this place. 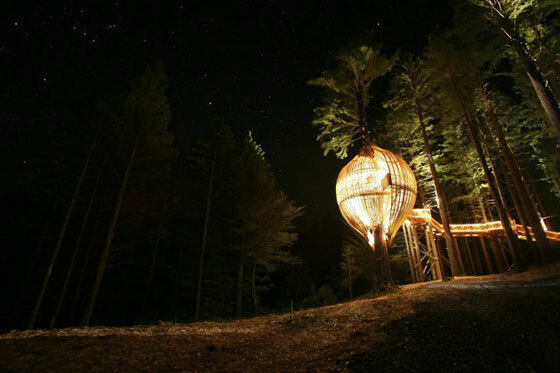 This airborne pod-shaped structure, situated over 32 feet above the ground in a Redwood Tree just north of Auckland, has a 30-person capacity and is almost exclusively used for private functions and events. Diners access this unique floating venue via an elevated wooden treetop walkway. These live musical theatre restaurants Down Under is designed to give you a side of fright with your meal. 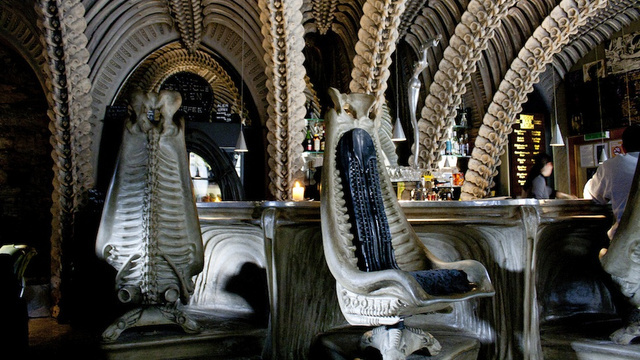 Guests can enjoy a delicious three-course dinner which begins with drinks in the Graveyard cocktail lounge followed by a two-hour live horror/cabaret show. There’s even a ghost train ride!